Pay at own risk with Cash App. 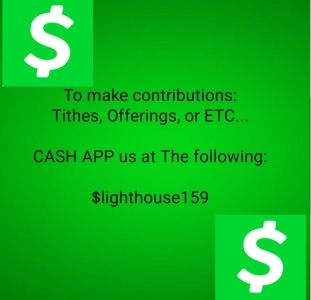 Please be advised that Lighthouse of Jesus Christ Independent Nondenominational Church is not responsible for any errors made by Cash App. You will need to contact the Cash App communication support listed below. All Cash App email communications come from ”@square.com”, @squareup.com” or “@cash.app” addresses. Official Cash App websites contain “square.com”, “squareup.com” or “cash.me.” Emails and websites originating from other addresses are likely phishing scams. To receive automated instructions over the phone, please call 855-351-2274. All other phone numbers are likely phishing scams. To keep your Cash App secure we recommend using a passcode on your phone and enabling the Security Lock Feature on your Cash App.